P2W is a leading water treatment company that specializes in treating industrial wastewater from various mining sectors. Our mission is to develop and implement the most cutting edge wastewater treatment technologies and help the industry to achieve sustainable solutions while improving production. Contact us for Water Treatment Solutions. 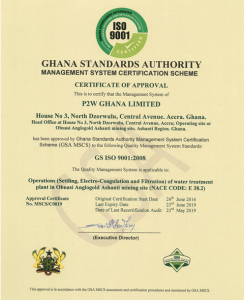 Established in 2005 with locations in Israel, Ghana, and South Africa, P2W (Pollution to Water) provides advanced industrial wastewater treatment systems to the gold, coal, and heavy metals mining sectors for the full destruction of cyanides and sulfate reduction. Based on its core technology, P2W develops markets, sells and installs efficient, cost-effective, and environmental-friendly wastewater treatment systems for heavy metal removal – Arsenic, Copper, Iron, Cadmium, Lead, Nickel, Manganese, Cobalt and Cyanide in all of its 4 forms. 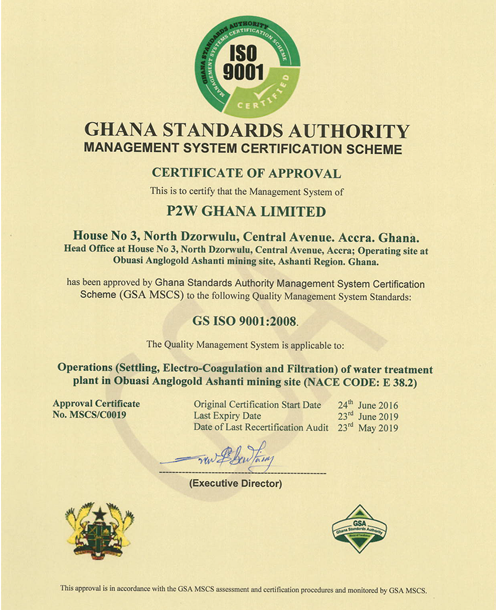 With operating plants, along with industrial heavy metal removal systems installed worldwide, P2W has demonstrated its capabilities in the absolute destruction of cyanide with very little resulting sludge and no secondary pollution in the effluents. In addition, P2W’s technology acts as a complete solution for the Acid Mine Drainage problem that currently plagues South Africa in particular. P2W is also a global export on the restoration and rehabilitation of polluted rivers and lakes. P2W advanced waste water treatment stands above the competing technologies as the only method that offers complete destruction– WITHOUT THE USE OF NEITHER MEMBRANES NOR CHEMICALS IN ITS TREATMENT PROCESS. Reverse osmosis technology has in recent years established itself as the leading method for treating water. This technology has proven its success in desalinating ocean water. However, using this technology for treating industrial wastewater is problematic since the pollutants in the water clog the membranes and require constant chemical treatment and frequent replacement of the membranes. This adds considerable expenditures to the treatment process and damages it’s functioning. The use of membranes also creates a brine stream which is considered a pollutant by government and international regulations. This stream of brine constitutes as a problem of itself and requires its own treatment. Despite its disadvantages, the use of RO membranes is quite common in the industry. P2W however offers a membranes free approach to industrial wastewater treatment. In other words, P2W offers the only wastewater treatment plant that is not dependent on the constant and costly maintenance and replacement of membranes, does not create a secondary and problematic pollution which is the brine stream byproduct and offers the removal of cyanide, heavy metals and sulfates. The use of chemicals is the most conservative and common method of treating industrial water. Despite its prevalence, the use of chemicals in the process results in water that are heavily laden with chemicals, which like the pollutants they treat, also poses a health and environmental risk and create a secondary pollution of their own. The use of chemicals also requires the constant management and dependence of chemical supplies. In contrast to that, P2W uses no chemicals in its treatment process. This creates not only cleaner water, but also eliminates any dependency on the availability of chemicals. P2W is also one of the only companies in the world that provides a singular online wastewater treatment process that treats all the pollutants in one solution. Other companies offer solutions that combine different and sometimes incompatible solutions. This results in a less than optimal treatment of water and leads to unnecessary costs. P2W creates a tailor-made solution for all of the client’s water problems and answers all water management challenges in one single online technology. As our track record shows, this singular system is not only the optimal way to treat industrial wastewater but also allows to control all of the treatment parameters, thereby ensuring the client that his water is treated 24/7. WE TAKE CARE OF ALL WATER MANAGEMENT ISSUES SO THAT THE CLIENT CAN FOCUS ON HIS MINING BUSINESS. NO MEMBRANES, WHICH RESULTS IN NO BRINE!! NO CHEMICALS- A GREEN PROCESS WITHOUT SECONDARY POLUTION ADDED TO THE WASTEWATER. REMOVAL OF SULFATES WITHOUT MEMBRANES WHICH RESULTS IN COMPLIANCE RATE OF 97%! !